Animates all currently running animations. Definition at line 1108 of file cfanim.c. References animate_one(), cf_object_remove(), CFanimation_struct::delete_end, CFanimation_struct::event, first_animation, CFanimation_struct::name, CFanimation_struct::nextanimation, CFanimation_struct::nextmovement, CFanimation_struct::paralyze, obj::speed, obj::speed_left, usec_elapsed(), and CFanimation_struct::victim. Checks if an animation can execute one or more moves, and if so does them. milliseconds time elapsed since the last time this function was called. Definition at line 1046 of file cfanim.c. References cf_log(), cf_object_set_flag(), cf_object_update(), FLAG_WIZ, FLAG_WIZCAST, FLAG_WIZPASS, CFmovement_struct::func, CFmovement_struct::id, CFanimation_struct::invisible, obj::invisible, llevDebug, mr_again, CFanimation_struct::name, obj::name, CFmovement_struct::next, CFanimation_struct::nextmovement, CFanimation_struct::paralyze, CFmovement_struct::parameters, PLAYER, obj::speed_left, CFmovement_struct::tick, CFanimation_struct::tick_left, CFanimation_struct::time_representation, time_second, obj::type, UP_OBJ_CHANGE, CFanimation_struct::verbose, CFanimation_struct::victim, and CFanimation_struct::wizard. Definition at line 1202 of file cfanim.c. Definition at line 1191 of file cfanim.c. Definition at line 1264 of file cfanim.c. Definition at line 566 of file cfanim.c. Referenced by get_command(), and prepare_commands(). new animation pointer inserted in the list of animations. Definition at line 753 of file cfanim.c. This function take buffer with a value like "blabla= things" and extracts some things. variable and value become pointers to internals of buffer. If buffer chages, they will change too and/or become invalid! Definition at line 677 of file cfanim.c. Definition at line 1218 of file cfanim.c. Definition at line 775 of file cfanim.c. References cf_find_string(), cf_map_get_height(), cf_map_get_width(), obj::env, FOR_MAP_FINISH, FOR_MAP_PREPARE, and obj::map. 1 if strg was processed, 0 else. Definition at line 708 of file cfanim.c. Referenced by initghosted(), initvisible(), initwizard(), and start_animation(). Definition at line 575 of file cfanim.c. References animationcount, compareAnims(), CFanimationHook::name, and prepare_commands(). Returns the direction from its name. direction or -1 if unknown. Definition at line 51 of file cfanim.c. 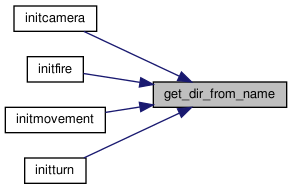 Referenced by initcamera(), initfire(), initmovement(), and initturn(). Definition at line 1165 of file cfanim.c. Definition at line 199 of file cfanim.c. Definition at line 215 of file cfanim.c. Definition at line 128 of file cfanim.c. Definition at line 243 of file cfanim.c. Definition at line 92 of file cfanim.c. Definition at line 292 of file cfanim.c. References cf_log(), get_boolean(), and llevError. Definition at line 450 of file cfanim.c. Definition at line 71 of file cfanim.c. Definition at line 415 of file cfanim.c. References CFmovement_struct::parameters, param_moveto::x, and param_moveto::y. Definition at line 386 of file cfanim.c. Definition at line 260 of file cfanim.c. Definition at line 274 of file cfanim.c. gethooksptr function to get the hooks. Definition at line 1157 of file cfanim.c. Definition at line 180 of file cfanim.c. References cf_log(), cf_strdup_local(), llevDebug, CFmovement_struct::parameters, CFmovement_struct::parent, and CFanimation_struct::verbose. Definition at line 399 of file cfanim.c. Definition at line 337 of file cfanim.c. References cf_log(), cf_strdup_local(), llevDebug, llevError, teleport_params::mapname, teleport_params::mapx, teleport_params::mapy, CFmovement_struct::parameters, and teleport(). Definition at line 467 of file cfanim.c. References cf_log(), llevError, and CFmovement_struct::parameters. Definition at line 107 of file cfanim.c. Definition at line 148 of file cfanim.c. Definition at line 164 of file cfanim.c. Is specified object currently being animated? ob object to search for. 1 if ob is part of animation, 0 else. Definition at line 739 of file cfanim.c. Parse an animation block in the animation file. buffer buffer to read data info, will have been modified when function exits. fichier file to read from. parent animation we're reading the block for. Definition at line 592 of file cfanim.c. References cf_log(), CFanimation_struct::errors_allowed, CFmovement_struct::func, CFanimationHook::funcinit, CFanimationHook::funcrun, get_command(), CFmovement_struct::id, llevDebug, llevError, CFmovement_struct::next, CFmovement_struct::parent, CFmovement_struct::tick, and CFanimation_struct::verbose. Definition at line 1195 of file cfanim.c. Definition at line 570 of file cfanim.c. Definition at line 203 of file cfanim.c. References cf_object_apply_below(), obj::container, mr_finished, PLAYER, obj::type, and CFanimation_struct::victim. Definition at line 220 of file cfanim.c. References AP_APPLY, obj::below, cf_free_string(), cf_object_apply(), cf_object_find_by_name(), FOR_OB_AND_BELOW_FINISH, FOR_OB_AND_BELOW_PREPARE, mr_finished, obj::name, and CFanimation_struct::victim. Definition at line 137 of file cfanim.c. References cf_log(), llevDebug, mr_finished, and CFanimation_struct::verbose. Definition at line 249 of file cfanim.c. References cf_free_string(), cf_object_drop(), cf_object_find_by_name(), mr_finished, and CFanimation_struct::victim. Definition at line 101 of file cfanim.c. Definition at line 301 of file cfanim.c. 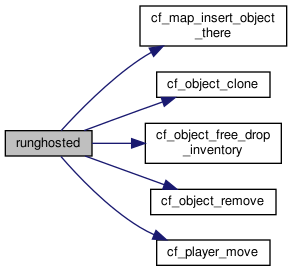 References cf_map_insert_object_there(), cf_object_clone(), cf_object_free_drop_inventory(), cf_object_remove(), cf_player_move(), CLEAR_FLAG, obj::contr, CFanimation_struct::corpse, FLAG_WIZ, CFanimation_struct::ghosted, CFanimation_struct::invisible, obj::invisible, obj::map, mr_finished, obj::type, CFanimation_struct::victim, CFanimation_struct::wizard, obj::x, and obj::y. Definition at line 458 of file cfanim.c. References cf_map_message(), obj::map, mr_finished, NDI_GREEN, NDI_UNIQUE, and CFanimation_struct::victim. Definition at line 79 of file cfanim.c. References cf_log(), cf_object_move(), cf_player_move(), obj::contr, llevDebug, mr_finished, PLAYER, obj::type, CFanimation_struct::verbose, and CFanimation_struct::victim. Definition at line 430 of file cfanim.c. References cf_object_move_to(), mr_again, mr_finished, CFanimation_struct::victim, obj::x, param_moveto::x, obj::y, and param_moveto::y. Definition at line 390 of file cfanim.c. References cf_player_message(), mr_finished, NDI_NAVY, NDI_UNIQUE, and CFanimation_struct::victim. Definition at line 264 of file cfanim.c. References obj::below, cf_object_pickup(), mr_finished, and CFanimation_struct::victim. Definition at line 279 of file cfanim.c. References cf_free_string(), cf_object_pickup(), FOR_BELOW_FINISH, FOR_BELOW_PREPARE, mr_finished, and CFanimation_struct::victim. Definition at line 190 of file cfanim.c. References cf_log(), cf_object_say(), llevError, mr_finished, and CFanimation_struct::victim. Definition at line 404 of file cfanim.c. Definition at line 376 of file cfanim.c. References cf_map_get_map(), cf_object_teleport(), teleport_params::mapname, teleport_params::mapx, teleport_params::mapy, mr_finished, teleport(), and CFanimation_struct::victim. Definition at line 478 of file cfanim.c. 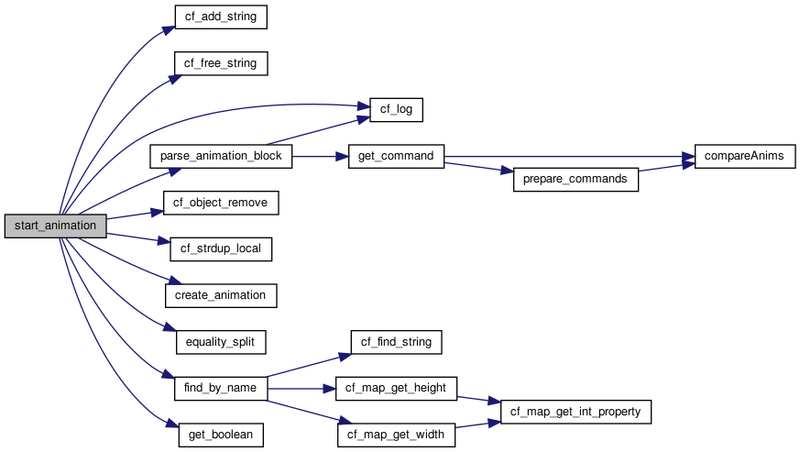 References mapdef::buttons, cf_log(), cf_map_get_sstring_property(), cf_map_trigger_connected(), CFAPI_MAP_PROP_PATH, oblinkpt::link, llevError, obj::map, mr_finished, oblinkpt::next, oblinkpt::value, and CFanimation_struct::victim. Definition at line 115 of file cfanim.c. References cf_log(), obj::facing, llevDebug, mr_finished, CFanimation_struct::verbose, and CFanimation_struct::victim. Definition at line 157 of file cfanim.c. Definition at line 173 of file cfanim.c. who object that raised the event leading to the plugin. activator object that caused who to get an event. event actual event object linking who and this plugin. Can be removed. file file name to read from, should be accessible from the current path. message if non empty, will be the name of the used animation instead of the one specified in the file. 1 if the animation was created, 0 else. fix memory leaks in case of errors. Definition at line 818 of file cfanim.c. References cf_add_string(), cf_free_string(), cf_log(), cf_object_remove(), cf_strdup_local(), CFanimation_struct::corpse, create_animation(), CFanimation_struct::delete_end, obj::env, equality_split(), CFanimation_struct::errors_allowed, CFanimation_struct::event, find_by_name(), get_boolean(), CFanimation_struct::ghosted, HUGE_BUF, CFanimation_struct::invisible, llevDebug, llevError, CFanimation_struct::name, CFanimation_struct::nextmovement, CFanimation_struct::paralyze, parse_animation_block(), PLAYER, CFanimation_struct::tick_left, CFanimation_struct::time_representation, time_second, time_tick, obj::type, CFanimation_struct::unique, CFanimation_struct::verbose, CFanimation_struct::victim, and CFanimation_struct::wizard. Return the number of microseconds between two timespec structures. This function was copied from common/time.c since linking is too hard. Definition at line 1099 of file cfanim.c. Definition at line 512 of file cfanim.c. Definition at line 562 of file cfanim.c. Definition at line 42 of file cfanim.c. Definition at line 564 of file cfanim.c. Definition at line 40 of file cfanim.c.